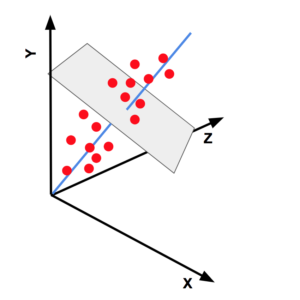 In this post, we will learn about Principal Component Analysis (PCA) — a popular dimensionality reduction technique in Machine Learning. Our goal is to form an intuitive understanding of PCA without going into all the mathematical details. At the time of writing this post, the population of the United States is roughly 325 million. You may think millions of people will have a million different ideas, opinions, and thoughts, after all, every person is unique. Right? Humans are like sheep. We follow a herd. It’s sad but true. 1. Do you support gun control? 2. Do you support a woman’s right to abortion? And so on and so forth. Technically, you can get different answers sets because you have 20 questions and each question has to be answered using a yes or a no. and accurately predict the answer to the rest of the questions with a high degree of accuracy. So, this 20-dimensional data is compressed to a single dimension and not much information is lost! This is exactly what PCA allows us to do. In a multi-dimensional data, it will help us find the dimensions that are most useful and contain the most information. It will help us extract essential information from data by reducing the dimensions. We will need some mathematical tools to understand PCA and let’s begin with an important concept in statistics called the variance. The variance measures the spread of the data. 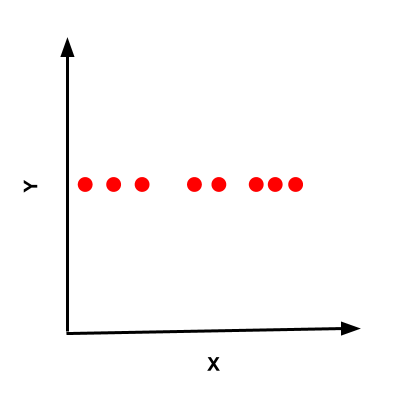 In Figure 1 (a), the points have a high variance because they are spread out, but in Figure 1 (b), the points have a low variance because they are close together. Also, note that in Figure 1 (a) the variance is not the same in all directions. The direction of maximum variance is especially important. Let’s see why. Why do we care about the direction of maximum variance? It is fair to say that there is no (or very little) information along the y-axis. You can compactly represent this data using n numbers to represent its value along the x-axis and only 1 common number to represent the constant along the y-axis. Because there is more variance along the x-axis, there is more information, and hence we have to use more numbers to represent this data. On the other hand, since there is no variance along the y-axis, a single number can be used to represent all information contained in n points along this axis. Now consider a slightly more complicated dataset shown in Figure 3 using red dots. The data is spread in a shape that roughly looks like an ellipse. The major axis of the ellipse is the direction of maximum variance and as we know now, it is the direction of maximum information. This direction, represented by the blue line in Figure 3, is called the first principal component of the data. The second principal component is the direction of maximum variance perpendicular to the direction of the first principal component. In 2D, there is only one direction that is perpendicular to the first principal component, and so that is the second principal component. This is shown in Figure 3 using a green line. Now consider 3D data spread like an ellipsoid (shown in Figure 4). The first principal component is represented by the blue line. There is an entire plane that is perpendicular to the first principal component. Therefore, there are infinite directions to choose from and the second principal component is chosen to be the direction of maximum variance in this plane. As you may have guessed, the third principal component is simply the direction perpendicular to both the first and second principal components. In the beginning of this post, we had mentioned that the biggest motivation for PCA is dimensionality reduction. In other words, we want to capture information contained in the data using fewer dimensions. Let’s consider the 3D data shown in Figure 4. 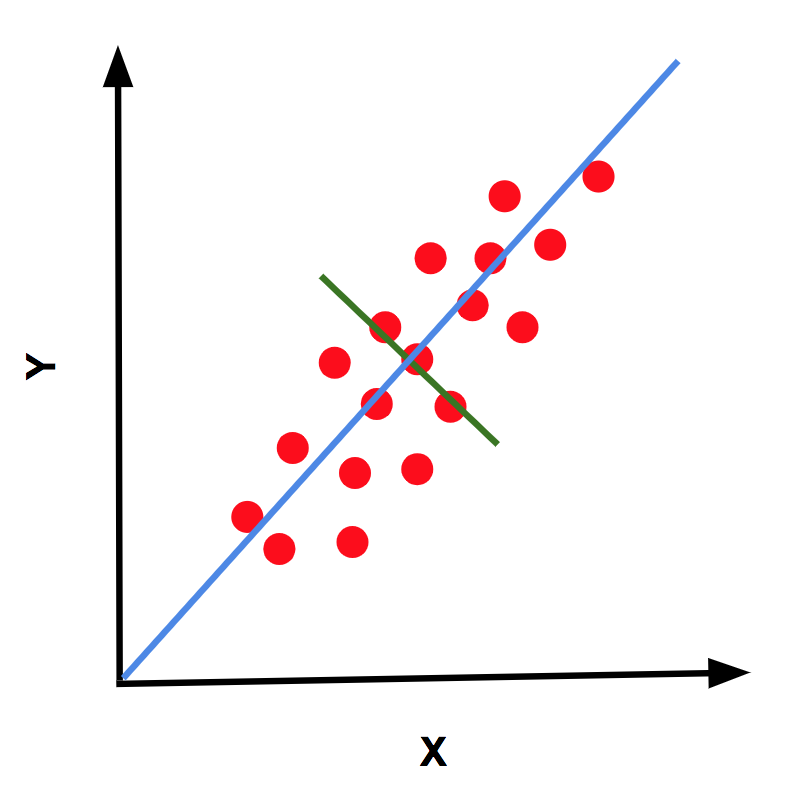 Every data point has 3 coordinates – x, y, and z which represent their values along the X, Y and Z axes. Notice the three principal components are nothing but a new set of axes because they are perpendicular to each other. We can call these axes formed by the principal components X’, Y’ and Z’. In fact, you can rotate the X, Y, Z axes along with all the data points in 3D such that the X-axis aligns with the first principal component, the Y-axis aligns with the second principal component and the Z-axis aligns with the third principal components. By applying this rotation we can transform any point (x, y, z) in the XYZ coordinate system to a point (x’, y’, z’) in the new X’Y’Z’ coordinate system. It is the same information presented in a different coordinate system, but the beauty of this new coordinate system X’Y’Z’ is that the information contained in X’ is maximum, followed by Y’ and then Z’. If you drop the coordinate z’ for every point (x’, y’, z’) we still retain most of the information, but now we need only two dimensions to represent this data. This may look like a small saving, but if you have 1000 dimensional data, you may be able to reduce the dimension dramatically to maybe just 20 dimensions. In addition to reducing the dimension, PCA will also remove noise in the data. What are Eigen vectors and Eigen values of a matrix? In the next section, we will explain step by step how PCA is calculated, but before we do that, we need to understand what Eigen vectors and Eigen values are. Let us multiply the matrix with the vector and see why I called this vector special. where . Notice, when we multiplied the matrix to the vector , it only changed the magnitude of the vector by but did not change its direction. There are only 3 directions ( including the in the example above ) for which the matrix will act like a scalar multiplier. These three directions are the Eigen vectors of the matrix and the scalar multipliers are the Eigen values. Usually, you can easily find the principal components of given data using a linear algebra package of your choice. In the next post, we will learn how to use the PCA class in OpenCV. Here, we briefly explain the steps for calculating PCA so you get a sense of how it is implemented in various math packages. Here are the steps for calculating PCA. We have explained the steps using 3D data for simplicity, but the same idea applies to any number of dimensions. 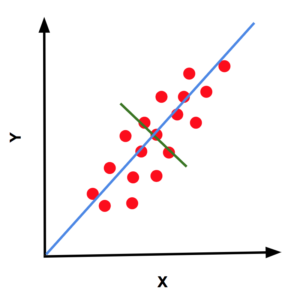 Calculate the Covariance matrix: Remember we want to find the direction of maximum variance. The covariance matrix captures the information about the spread of the data. The diagonal elements of a covariance matrix are the variances along the X, Y and Z axes. The off-diagonal elements represent the covariance between two dimensions ( X and Y, Y and Z, Z and X ).The covariance matrix, is calculated using the following product. where, represents the transpose operation. The matrix is of size where is the number of dimensions ( which is 3 in our example ).Figure 5 shows how the covariance matrix changes depending on the spread of data in different directions. Figure 5: Left : When the data is evenly spread in all directions, the covariance matrix has equal diagonal elements and zero off-diagonal elements. Center: When the data spread is elongated along one of the axes, the diagonal elements are unequal, but the off diagonal elements are zero. Right : In general the covariance matrix has both diagonal and off -diagonal elements. Calculate the Eigen vectors and Eigen values of the covariance matrix: The principal components are the Eigen vectors of the covariance matrix. The first principal component is the Eigen vector corresponding to the largest Eigen value, the second principal component is the Eigen vector corresponding to the second largest Eigen value and so on and so forth. If you are more interested in why this procedure works, here is an excellent article titled A Geometric Interpretation of the Covariance Matrix. b) I know a republican (tea party) who is … pro abortion (other ex: if binational Israeli American think republican will favor more Israel, even if they can be seen as liberals, they can choose Republican … or not) . Sure no dataset would be perfect and therefore dimensionality reduction is lossy. I really don’t care about synthetic datasets as it leads to a boring article and the audience cannot even relate to it. You will find hundreds of such articles on the internet that you can refer to, or write one yourself :P.
with a hand drawing software? noting it is worse than hundreds of tutorials on the web). There is already such a source for EVERY machine learning concept. It is called Wikipedia and it is the best source if you are looking for plain hard math, some good examples etc. My goal in this article was to provide both intuition and some entertainment. Clearly, it is not for people like you who want more rigor from a blog post? Really? This blog is deliberately written in a more relaxed style and if you want rigor you should be reading some scientific papers or Wikipedia. Yeah, a relaxed style, coming from a teacher and an authority, does not dismiss some of the oversights in this post. See my below comment. Really disappointing. Also I should mention that sassing everybody in the comments is not helping your case. I read scientifical papers (in an uninteresting domain in this context and for image processing ) and wikipedia – verified Wallace position with it- in many domains. 🙂 I think we have both made our points, and we have at least one thing that we agree on — politics stirs passion. I understand why you feel political commentary is distracting. I know you are right about wikipedia; however, wikipedia can be fully prohibited in some countries, which might have consequences on your audience (statistical, mathematical and computer science are often exceltent). Yeah, tossing in politics as an example for classification is a no go. I get enough politics without needing it to infect my ML learning until I want to explore the issues myself. politics classification uses (in a very -over?- simplified way) categorical variables (0/1 : the category “do not know” does not exist) which cannot be visualized the same way. Most of images have real valued features/colors, gradients …., at least when starting. A well known dataset (the iris one, 1938 : before flower power: cannot be distracted with politics : ask google wikipedia with “iris flower dataset”) or synthetical one -one knows the solution- would have been more appropiate. Discrete valued functions can transformed to continuous all the time for analysis. It is not a problem. You are free to write your own article with the “more appropriate” dataset. I will choose examples that I like :D.
one is free *not* to write anything (PCA has been known since 1938; Benzecri -a wikipedia tag- in 1970 analysed Lebanon polls (and its most interesting part : why people do not answer some questions: they had,IIRC, interesting ways of displaying informations). This site, with known examples, makes a great contrast with your astrology example (is the Huff post a scientific journal? what do you hint at). OTOH, I managed to enhance quality of grey conversion of some political video with looking at the 3 channels colors, noticing R and G are very correlated -this is verified on some extracts- , that the 1rst – un normed- component is , in BGR space, (0.5,0.8 ,1), very different from classical color->grey conversion (it is 1rst step in finding good features to track -works in monochrome- , if 2nd and 3rd components are noise, one might hope trackers will work better). Also, political bias often requires severe dropout in order to prevent overfitting of preconceptions. Satya, you’re missing the point. MV is right; this was a poor take for a couple of reasons. First of all, you don’t actually cite the study of political views; you just speculate as to what would happen. In my experience as a political researcher your conclusions are exactly what someone who reads the news once a week would expect – but they’re not actually the case. So, issue 1: base assumption not true. Issue 2: base assumption, coming from a data scientist like you, though false, pushes people to believe that political issues invariably fall on a singular bicameral political axis. Your authority makes it dangerous for you to advance this unfounded claim. Issue 3: Over and over and over and over in data science, we have to go over with people how humans are not data points. Outliers matter. “not much information is lost,” by which you mean a model gets maybe 80% right, leaves out outliers—and when we’re talking about humans, outliers MATTER. I recommend you read Weapons of Math Destruction. In your position as a teacher and blogger, you need to think about how the way you frame your teaching affects larger society. We also had this same issue with your use of the Lena image in your very first OpenCV course. You need to be much, MUCH more aware of the impact of your framings. It seems you’re either not employing or not listening to people who could help you fix this. The leading example was meant to show data has lower dimensionality than it may appear at the outset. It succeeds in making that point. Second, a blog post is not a scientific paper. It does not have to be rigorous. If I were being rigorous, I would cite papers. Third, I truly believe reading the news everyday makes people stupid. This is especially true when people subscribe to only one newspaper. Otherwise, half the nation would not be “shocked” at results of the elections :P. Clearly, they had been reading the analysis of astrologers at the Huffington Post who predicted 98% chance of win for Hillary while throwing away common sense. They also claimed to use rigorous data science! Most news sources ( on both sides of the political aisle ) use data to essentially lie or create fake outrage. So you are better off consuming less of it. Well, which nation/nation half was shocked? Can you prove they read the huff post? As a rule of thumb, if you feel the need to toss politics into places other than the news, perhaps you should be a reporter. Satya, thanks for your post, interesting as always. Haters is a strong word. They are simply people with different opinions. It is just that if authors / writers / creators start caring too much about public opinion and pleasing everybody, we lose our originality and are left with bland and unoriginal content. Very informative article, i have been struggling to understand PCA and LDA for sometime. Sorry, I’ll take the opposite opinion and say that the political example was spot on. It immediately made the point.